September 12, 2012: (Part 2 of 2) For ten days the CAC staff worked with HODI coaches for three hours in the morning, covering CAC’s Chance to Choice curriculum as well as teaching a coaching style that correlates with football for social development, and then in the afternoons piloting the new GOAL games that addressed themes such as self esteem, confidence in voice, health and hygiene, community support and many others. In the afternoons coaches also participated in GOAL classroom activities where movement, group work and collaboration were the priorities. With each new GOAL game a female athlete role model’s story was shared, opening up the coaches minds to the possibilities that existed in the world for females. It was a great time to share especially considering the London 2012 Olympics had just ended and the majority of coaches didn’t see any of the events and were unaware of the incredible female athletes that had competed for their respective countries. It was a great opportunity to also share about the female Muslim athletes that had taken great strides to compete or the African female runners that had made their countries proud. Coaches held on to the stories and even quizzed each other during the weeks based on the information shared. After 45 hours on the field, Coaches Across Continents congratulating the coaches at the certificate ceremony. HODI coaches were proud to be the first group of coaches who were taught the GOAL games and always participated with a lot of energy and enthusiasm. Mia Hamm Communication, Sawa’s Rights and Nicola’s Expressions became favorites as each game gave a role model’s story, practiced an important life skill and was competitive and fun. All of the GOAL games are consistent to Coaches Across Continent’s approach to football for social development, in that the games are used to teach the life skills and the coaches’ role includes creating the learning environment for the youth on the field. Coaches have to be trained to deliver games, be capable of finding the teachable moments and then connecting the skill on the field with the youth’s life off the field. Practicing healthy behaviors on the pitch like using one’s voice, communicating with teammates, solving problems and dealing with cheating are all skills that run throughout Coaches Across Continents curriculum and now new skills are being introduced that will be taught to many more coaches and participants through the GOAL On Field Program! 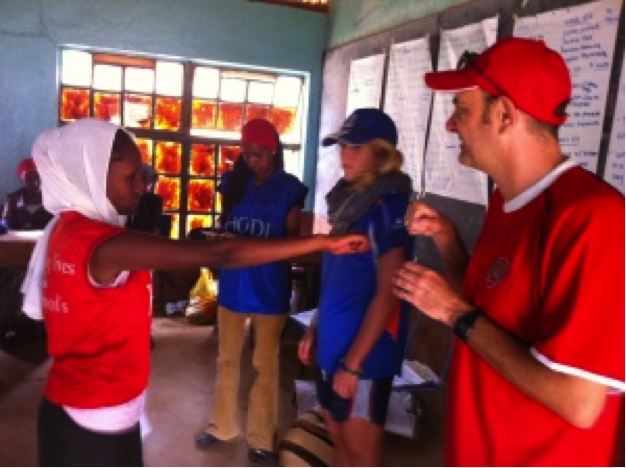 In fact the HODI program directors and head coaches were so impressed by the GOAL On Field Program that they committed to running the 24-week curriculum with their 6,000 HODI youth participants. HODI is also interested in implementing the GOAL curriculum in the classroom after seeing the response from the female participants and realizing that as a combination, the in classroom skills and the on the field skills can help to address local issues facing female youth in Marsabit. The interest in the GOAL curriculum would introduce Women Win to the partnership, which are well equipped to teach the coaches and program directors of HODI to deliver the many activities that complement the GOAL On Field Program. GOAL aims to reach 100,000 young women in the next 18 months. With the new GOAL On Field Program GOAL participants will be able to learn, become aware of important issues and practice life skills in both the classroom and on the football or sports field.